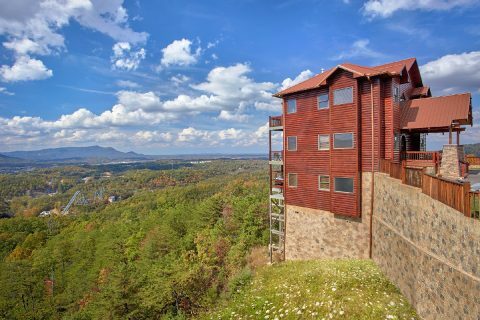 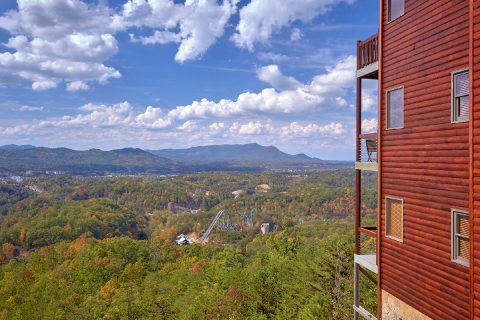 Want a Pigeon Forge cabin that keeps you close to Dollywood and other Smoky Mountain attractions you love? 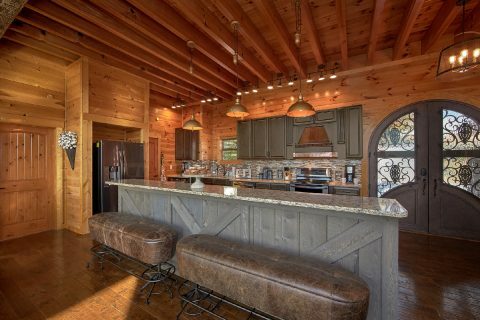 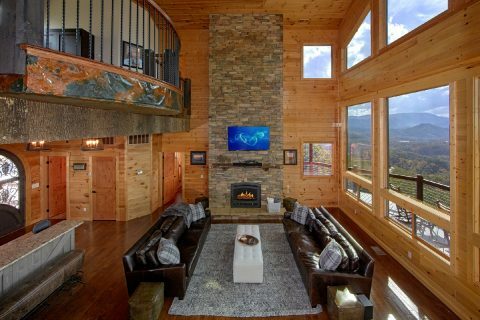 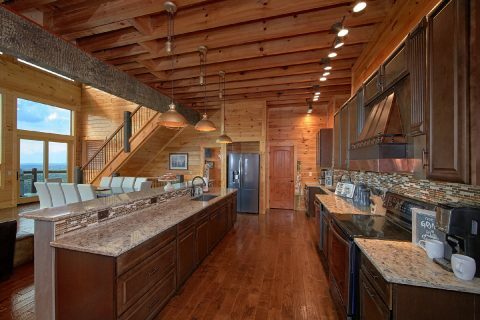 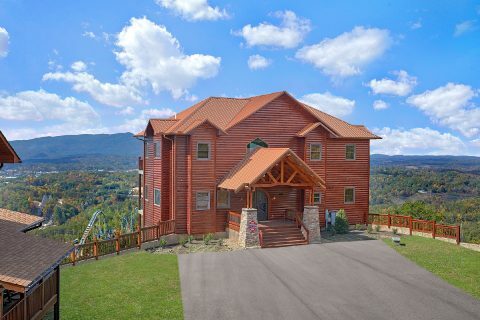 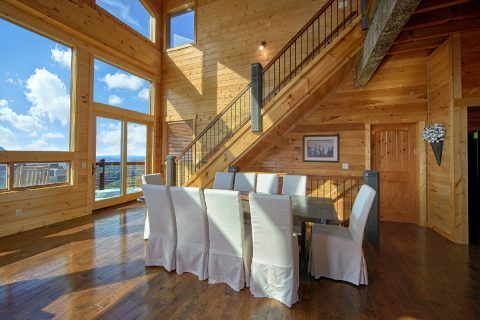 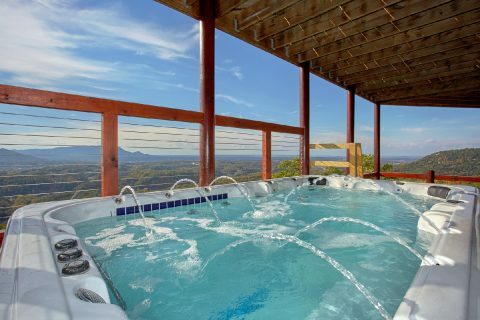 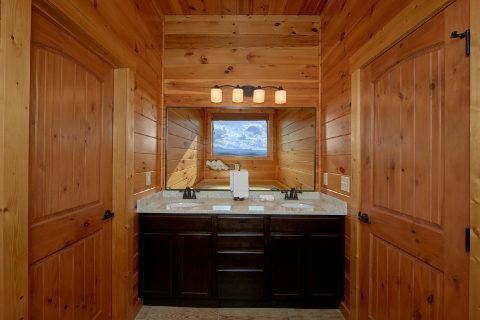 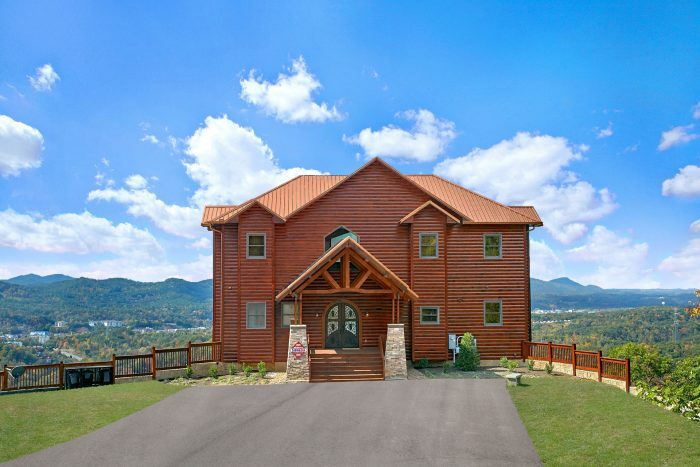 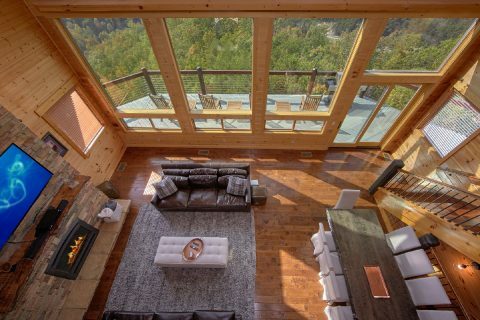 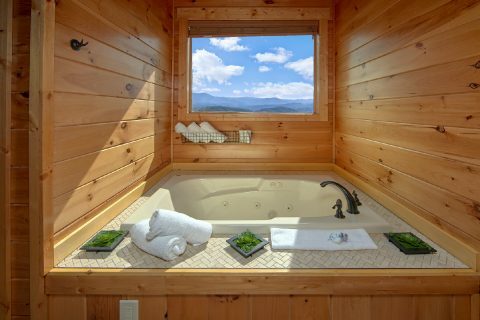 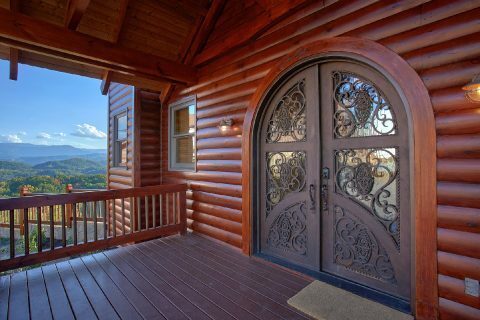 Check out the luxurious cabin "Copper Ridge Lodge" for a Smoky Mountain getaway you won't soon forget! 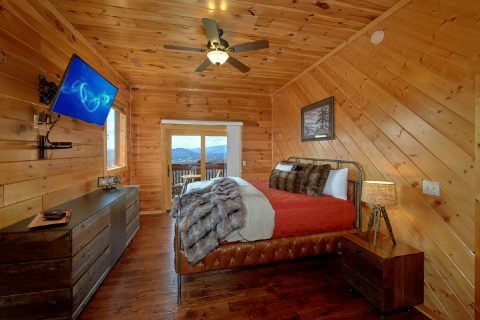 This spacious, 6-bedroom cabin in the Starr Crest Resort area sleeps up to 16 guests, so it's an ideal choice for a group gathering or a large family vacation. 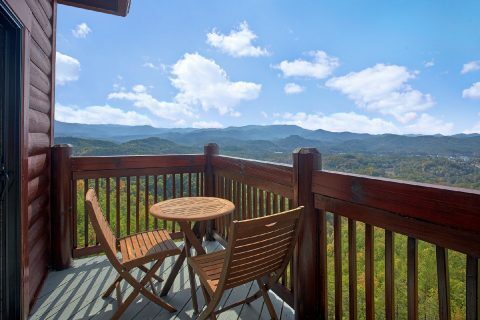 This cabin rests on a Smoky Mountain ridge only 2.5 miles from the entrance to Dolly's popular theme park. 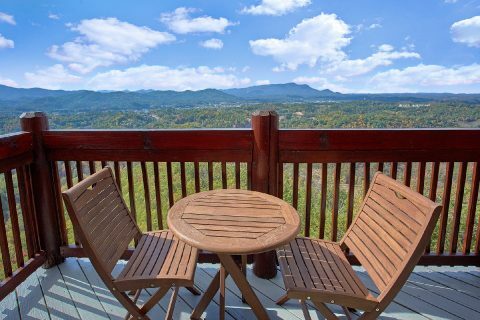 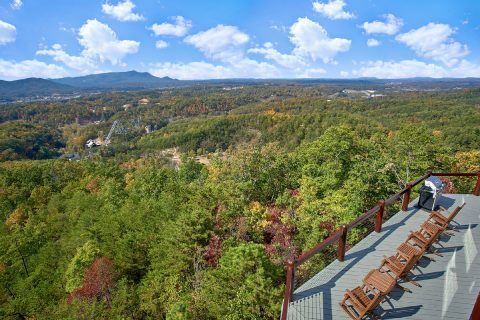 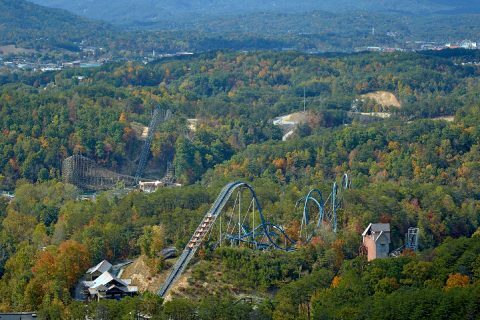 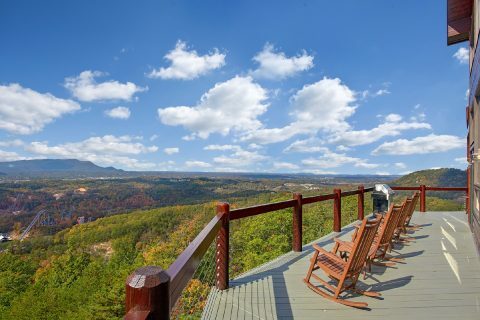 In fact, this rental sits on property that's adjacent to the park and the cabin even boasts a view that overlooks Dollywood! 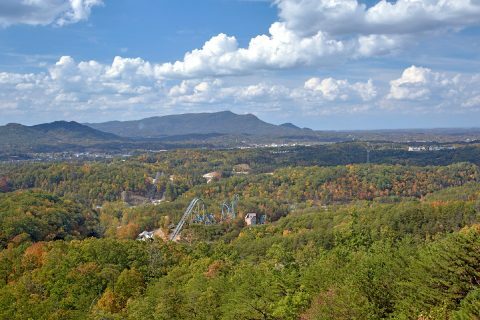 Fun attractions in Pigeon Forge like the Historic Old Mill, the Island, and the Titanic Museum are only a short drive further on the Upper Middle Creek road from Starr Crest Resort. 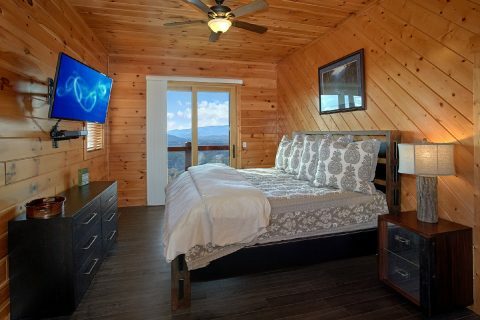 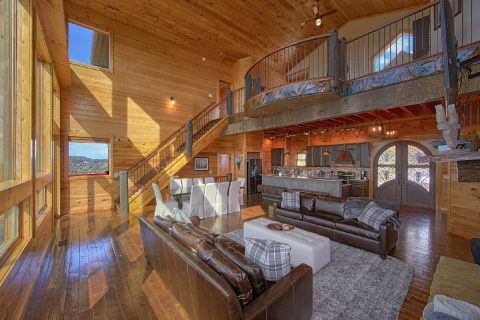 Not only does this spectacular cabin offer an astounding mountain view, but it also features an excellent lineup of amenities designed to make your stay truly relaxing and fun. 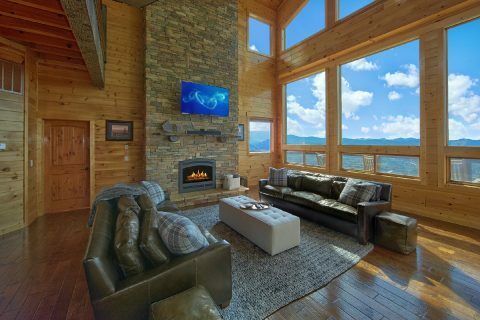 On the main level of your cabin, you'll find a luxurious living area complete with a large-screen television and a fireplace. 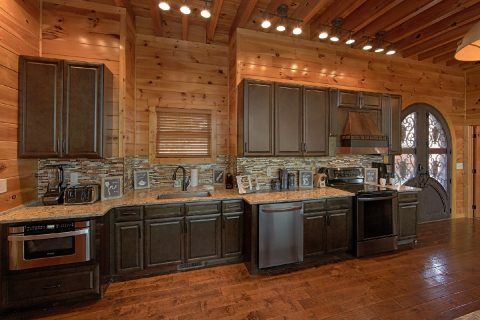 Nearby, the fully-equipped kitchen and dining area is the perfect place for making great meals on your vacation. 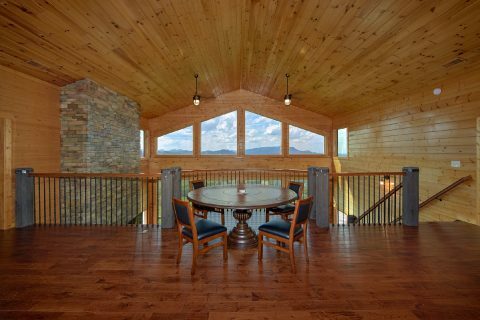 From here, you can step outside onto your cabin's main deck with patio seating and cocktail tables, the perfect place to enjoy a cup of coffee while you take in a beautiful 180-degree view. 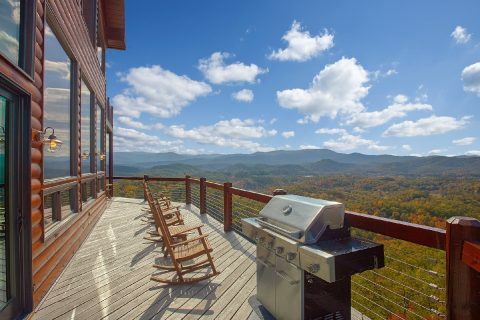 This deck also features a gas grill for enjoying a fun summer cookout during your stay. 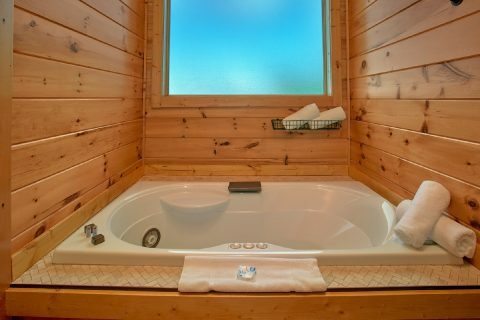 The main level also offers 2 private king bedrooms with jacuzzi tubs. 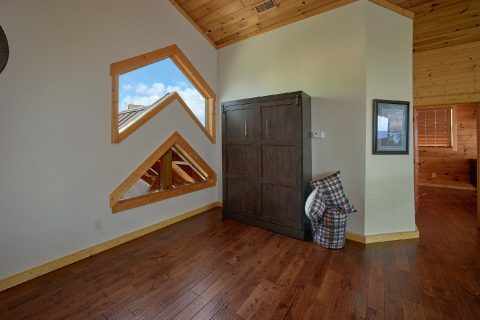 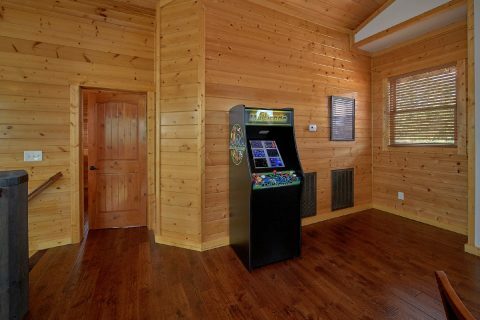 The top floor of your cabin features a loft area complete with a poker table and a full-size murphy bed. 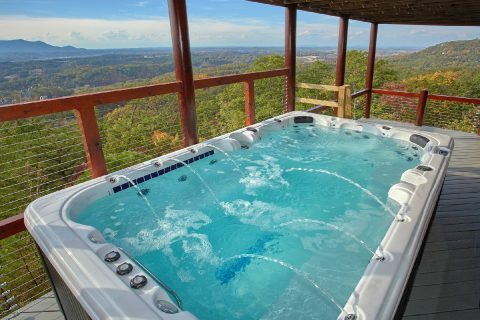 This level houses 2 king-size bedrooms that boast jacuzzi tubs and private balconies. 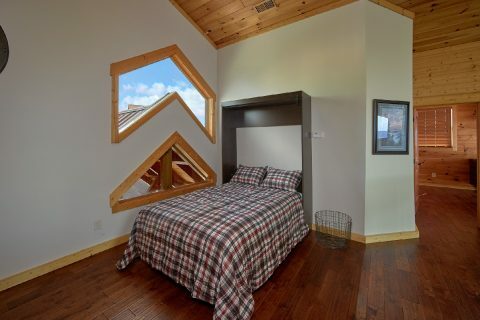 One of the bedrooms is the master suite and features a custom, walk-in shower. 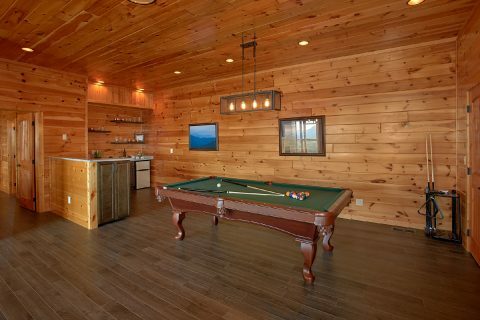 Downstairs, you'll find luxurious full entertainment room with a pool table, bar area, and large flat-screen television for watching your favorite movies and shows. 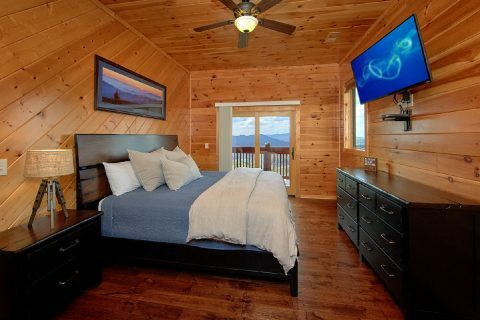 This room also boasts comfortable furnishings like the over-sized sectional sofa with a queen pull out bed. 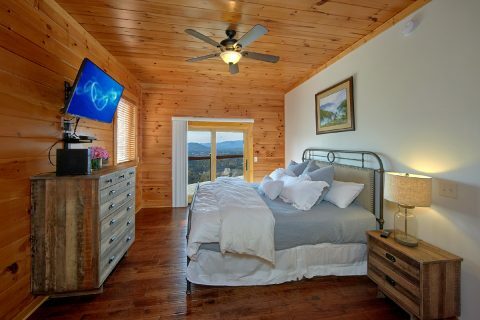 Nearby, 2 king-size bedrooms offer plenty of comfortable sleeping space. 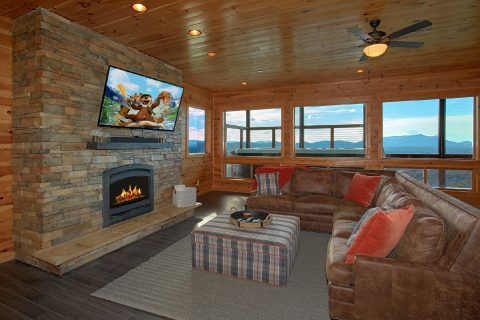 Stay warm by the fireplace while you enjoy a cool Smoky Mountain evening at your cabin. 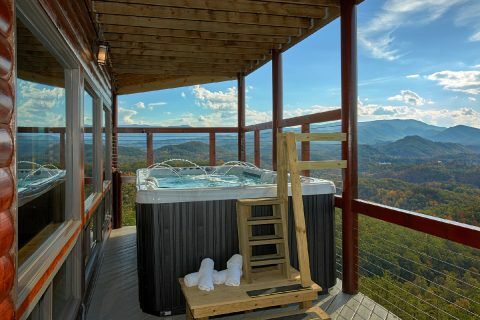 Step out onto the lower deck with a large swim spa that offers room for up to 11 people. 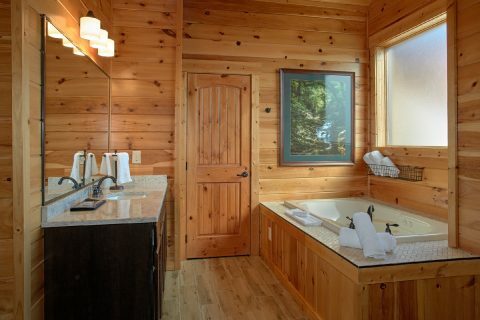 For a relaxing soak in privacy, your cabin also comes with a jacuzzi tub in each of the 6 king suites. 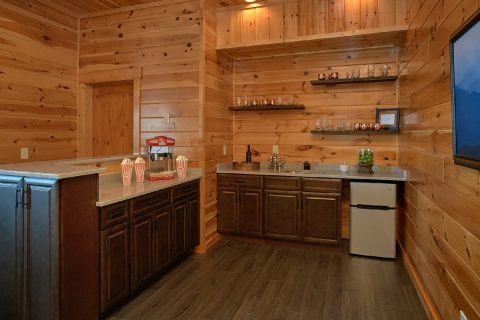 On top of all these terrific cabin comforts, you'll also enjoy practical amenities like WiFi Internet access and a washer-dryer that all help to ensure your vacation is simple and care-free! 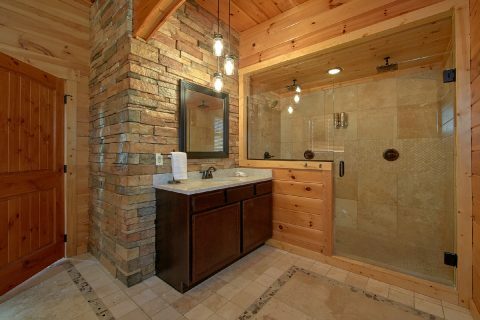 Guests of this cabin will enjoy resort swimming pool access through the Starr Crest Resort community. 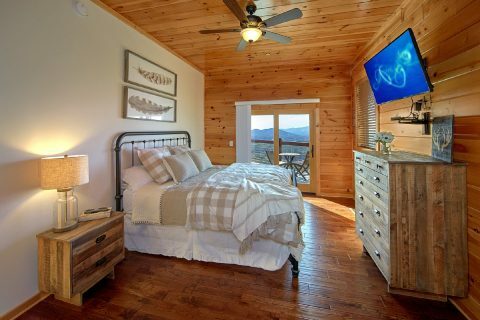 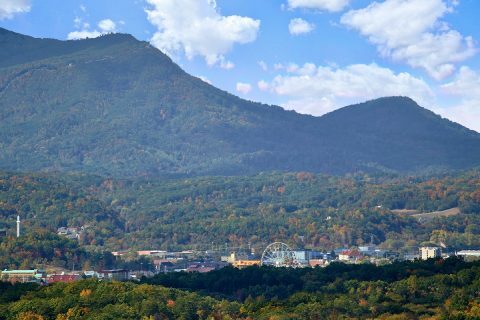 When you return from an exciting day exploring fun attractions in Pigeon Forge or visiting natural wonders in the Great Smoky Mountains National Park, you'll definitely need some shut-eye. 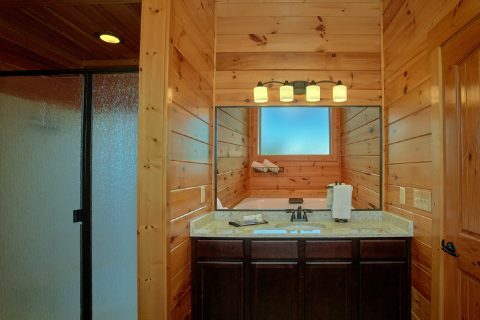 Luckily, your cabin offers 6 comfortable king-size bedrooms and a full bed for plenty of private sleeping space. 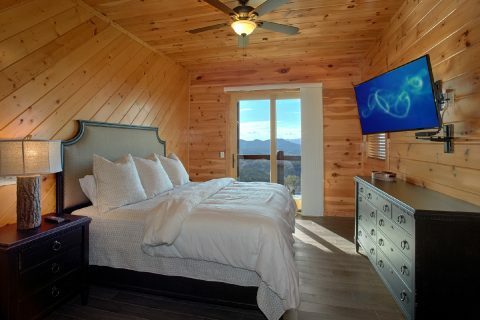 Altogether, "Copper Ridge Lodge" sleeps up to 16 guests in comfort. 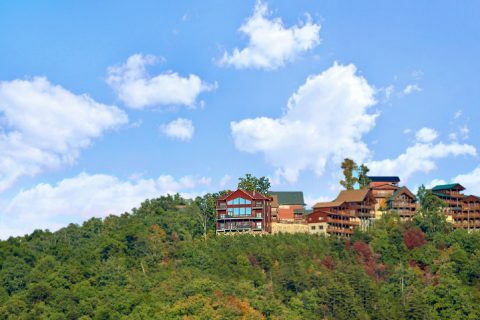 Best of all, you can reserve this large, group cabin close to Dollywood for a special nightly rate! 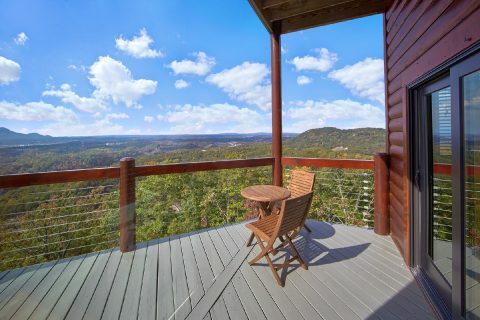 Simply check this cabin's availability for the dates of your trip to see how much you'll save!